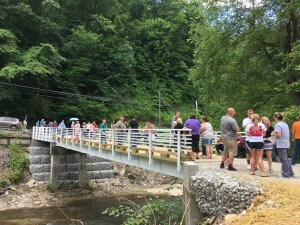 Families gather on the new Elmer Brown Bridge in West Virginia following an extensive construction project that didn’t seem possible. Two years ago there was a flood in Mingo County, WV. And for 14 families on Elmer Brown Drive in Delbarton, it was a day that changed everything. The flood waters cut into the hill under the bridge they relied on, and the side of the state road caved in, causing the structure of the bridge to fall three feet, twisting the metal and making the bridge unpassable. The families were cut off from direct access to schools, medical help and easy access to supplies. As the water receded, they found paths to get in and out. But hauling groceries down a railroad track, across a stream, up a bank and a mile down a gravel road by wheelbarrow is a bit more labor intensive than driving home in a car. None of the 14 families had the resources to rebuild the bridge, and it was not a state-owned bridge. Three months later I heard about the people of Elmer Brown Drive in a meeting of WV VOAD (West Virginia Voluntary Organizations Active in Disaster). WV VOAD is a table that state agencies, national organizations, state religious organizations and others gather around to share resources and tasks to address the issues arising from natural and human-made disasters. 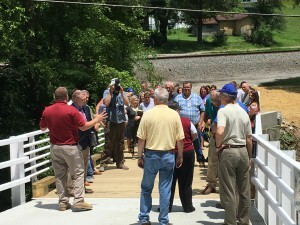 That morning we heard that over 600 private bridges had been damaged or destroyed in WV by the recent floods and that approximately 300 bridge owners had no resources to repair or rebuild their bridges. Some homeowners had already replaced their bridges and were paying on loans for those bridges when the flood washed them out again. With pervasive poverty, many on fixed incomes and with multiple generations in the homes, there was a critical need for bridges. So a small committee was formed to begin to explore how this might be addressed. Opening a new bridge in Mingo County, WV, was cause for celebration. Frankly, we all agreed. But something had to be done, and we were the only ones who could. There was laughter, but it tasted sad and bitter. We scheduled another meeting in two weeks. I laughed. This time with hope. We began work in earnest, starting with a pilot project of 20 bridges, a Mennonite architect and engineer Johann Zimmerman working for free, and piles of legal paperwork began to be sorted out. 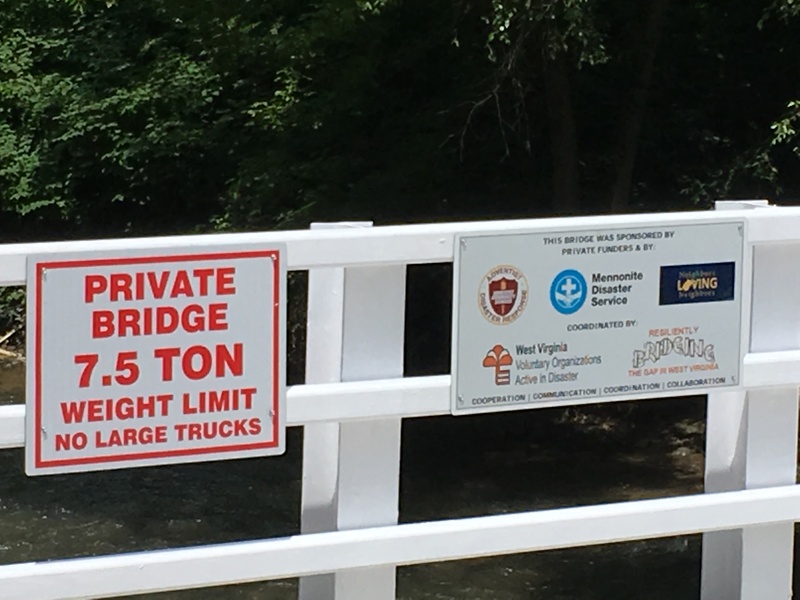 We set a high standard for the bridges — they had to be able to carry the weight of the heaviest ambulance in the county plus 10 percent. Bridge building began a year and a half ago. 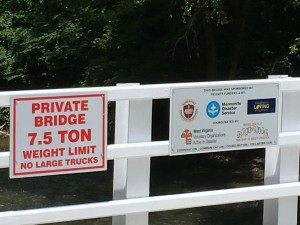 And on June 13, 2017, we opened bridge No. 35 at Elmer Brown Drive. It was our largest project to date. It is 105 feet long when you count in the state’s nine-foot portion. When we did the first cost estimate it was $400,000. But with our volunteers the final cost was a much slimmer $71,000. At the dedication of the Elmer Brown Bridge, the 14 families gathered to pray, celebrate and thank God for promises made and promises kept. It had been two years almost to the day since their world changed. There was much laughter, some tears and great applause, and the whole community drove in parade across the bridge. Building something other than a walking bridge seemed impossible but eventually came to fruition. They will remember those two years without a bridge, the hard work of daily life, the family member who died because the ambulance could not get there in time and the fear that no one would help. But they will also remember the people who cared, who made a way where there was no way, who kept working in the face of so many naysayers, who shoveled, hammered, poured concrete and prayed together to make a bridge arise. Rodney is a bit of an “Eeyore,” but he always is faithful to the voice of God. If you give him a day to think he always solved the problem. He is a wonderful loving example of what it can mean to be a disciple of Christ. There is still much to do. Including the great flood of a year ago and the latest flooding, we have a total of 420 bridges that need our help. We need about $6 million to complete those bridges with the help of volunteers. The sound of that makes me laugh — it seems like an impossible dream. But God is a master at making the impossible happen. God chooses to use Rodneys and Barbaras and Debras and Tims and Sarahs and Abrahams and Marys and Josephs to fulfill the promises made to the people of God. The Presbyterians are a part of that process, working to build bridges where there was no way. Join in the laughter. Contact me, Barbara Chalfant, at the Presbytery of WV (304-744-7634) or via email at missions@wvpresbytery.org.